Welcome to the March 19, 2014 edition of ACM TechNews, providing timely information for IT professionals three times a week. Microsoft Research principal Leslie Lamport will receive the 2013 ACM A.M. Turing Award, widely considered the Nobel Prize in computing, for his breakthrough work in "imposing clear, well-defined coherence on the seemingly chaotic behavior of distributed computing systems, in which several autonomous computers communicate with each other by passing messages," according to ACM. Lamport's algorithms, models, and verification systems have given distributed computer systems major roles throughout the data center, security, and cloud computing environments. 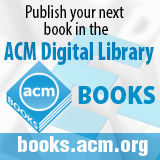 "By finding useful ways to write specifications and prove correctness of realistic algorithms, assuring a strong foundation for complex computing operations, [Lamport] helped to move verification from an academic discipline to a practical tool," says ACM president Vint Cerf. Lamport is being honored for milestones that include the concept of Byzantine failure, and temporal logic language. Lamport worked at Digital Equipment Corp. and SRI International before joining Microsoft in 2001. His 1978 paper, "Time, Clocks, and the Ordering of Events in a Distributed System," is one of the most highly cited papers in computer science. The White House today will announce its Climate Data Initiative, through which it will partner with more than a dozen major technology firms, universities, and private groups to create tools that will help communities adapt to climate change. A new website, climate.data.gov, will provide central access to climate change data, with previously unreleased information mapping hundreds of thousands of U.S. bridges, roads, railroad tunnels, canals, and river gauges. "It's going to be a huge asset in preparing communities for climate change," says John Holdren, director of the White House Office of Science and Technology. Google says it will use the data to create what it says is the first terrain map of Earth to show the impact of climate-related changes. Google's Rebecca Moore says the map will enable people to prepare for climate extremes "as easily as they use Google maps to get driving directions." Microsoft says it will donate 800 terabytes of cloud storage to 40 climate-change research projects, and it will offer customized versions of its free Fetch Climate tool to communities. Intel plans to host three climate-change hackathons this year that will challenge students to use federal data to create new apps and tools. The U.S. government wants to prove that it is serious about Internet freedom by ending its oversight of the domain name system. The U.S. Commerce Department recently announced that it plans to transition away from its relationship with the Internet Corporation for Assigned Names and Numbers (ICANN) to a multilateral structure that includes engineers, nonprofits, and other stakeholders in the decision-making process for managing the Internet. The move comes at a time when the credibility of the U.S. government has come into question due to Edward Snowden's disclosures about the U.S. National Security Agency (NSA). Russia and other nations could use the NSA reports to call for greater government control of the Internet at conventions this year. The U.S. government will continue to strongly resist such a push, and could decide to maintain the status quo if the International Telecommunication Union, part of the United Nations, attempts to take over control of ICANN. Several telecom companies praised the move, and some Silicon Valley executives said it was inevitable. However, Syracuse University professor Milton Mueller is concerned that ICANN could gain too much control over policy making and implementation of the root. "That makes them really hard to control," Mueller says. Science and technology graduates increasingly are pursuing a hybrid professional science master's degree, or science M.B.A., to broaden their career opportunities. Enrollment in professional science master's degree programs increased 23 percent from 2010 to 2013, according to the Council of Graduate Schools, while overall graduate enrollment is growing only in the single digits. Computer and information sciences are the most popular of these degrees, followed by environmental sciences and natural resources, mathematics and statistics, and biotechnology. "More than 90 percent of professional science master's graduates that we surveyed for 2013 were employed in a job related to their field of study," says Council of Graduate Schools president Debra W. Stewart, noting that students increasingly are pursuing degrees that prepare them for a range of career settings. Professional science master's degree programs began in the late 1990s, with funding from the Alfred P. Sloan Foundation, and are now offered at almost 140 educational institutions. At University of Maryland University College, the master's program requires students to complete a project or internship with cross-training in business. The program partners with local companies willing to host student projects, which provides students with real-world work experience and often is beneficial to startups with limited resources. Facebook's new artificial intelligence (AI) team reports that it has developed software that can match faces with 97.25-percent accuracy, compared to human beings' 97.53-percent accuracy. The DeepFace software is an application of deep learning, in which networks of simulated neurons are used to learn to identify patterns in large amounts of data. DeepFace uses a two-step technique to process face images, and in the first step it corrects the angle of the face so the person in the image faces forward, using a three-dimensional image of an "average" forward-looking face. In the second step, the simulated neural network generates a numerical representation of the reoriented face, and if the software yields sufficiently similar descriptions from two different images, it concludes they must show the same face. Although DeepFace executes facial verification rather than facial recognition, AI team member Yaniv Taigman says some of the former function's underlying methods can be applied to the latter. University of Washington researcher Neeraj Kumar says Facebook's results demonstrate that finding enough data to feed into a large neural network can facilitate substantial improvements in machine-learning software. As the search continues for Malaysia Airlines Flight 370, crowdsourcing has emerged as a solution that could enable the public to help scan satellite imagery to find the missing jetliner. U.S.-based satellite imagery firm DigitalGlobe has created a website that enables the public to study satellite images square by square, and more than 2 million people worldwide are participating. Disaster responders are increasingly relying on images from satellites, planes, and volunteers to map out important features of an area. Volunteers can then access these images through Web-based platforms and collaboratively identify specific elements in the pictures. During the Haiti earthquake response effort, for example, satellite maps helped identify collapsed buildings and navigable routes. Although mapping projects been successful, search efforts are far more difficult, requiring good eyesight, an understanding of debris features, and contextual knowledge such as the angle from which the picture was taken. Large crowdsourcing efforts require a combination of human computation techniques and machine-learning algorithms, with an initial training phase before the search begins, writes University of Southampton lecturer Sarvapali Ramchurn. In addition, Ramchurn says volunteers become less accurate over time with repetitive tasks, and should take breaks and be tested periodically for accuracy. Researchers at Nippon Telegraph & Telephone, Mitsubishi Electric, and the University of Fukui have entered their new authenticated encryption algorithm in the Competition for Authenticated Encryption: Security, Applicability, and Robustness (CAESAR) project. The researchers say the algorithm offers strong resistance to multiple misuse in authenticated encryption operations, simultaneously providing confidentiality and integrity. Attackers can hide data tampering once a conventional system outputs decrypted plaintext from tampered data without authentication, but the new algorithm fixes this problem. Moreover, the algorithm addresses the problem regarding the reuse of nonce. The researchers also note the algorithm accepts messages longer than the 64 GB limit of the Advanced Encryption Standard with Galois Counter Mode (AES-GCM), and it works faster than AES-GCM on many platforms. The first results of CAESAR screening will be announced on Jan. 15, 2015, and the third-party cryptanalysis should lead to wide acceptance. NTT and Mitsubishi will use the results to develop products and services for machine-to-machine applications that incorporate the new algorithm. Northeastern University researchers have published a paper concluding that Google's efforts to track flu outbreaks based on user searches have not met their potential. Google Flu Trends significantly overestimated flu cases in the 2012-2013 season, and the latest data also appear inaccurate, according to Northeastern's David Lazer and his colleagues. Google's challenges mirror those faced by all social science big data projects in analyzing large segments of the population using mobile or social media technology. The researchers theorize flu cases are overestimated in part because Google's algorithm suggests related searches, so the number of flu-related searches is much higher than the number of actual cases. The Google Flu team also had to distinguish between flu-related searches and searches that are correlated with the flu season but not related. The team used more than 50 million search terms and paired them with about 1,100 data points on flu prevalence from the U.S. Centers for Disease Control and Prevention. Lazer says correlating such a large number of terms will inevitably produce some faulty results. However, he says the potential of big data is "mind-boggling," and the problems with Google Flu Trends can be fixed, such as by increasing cooperation between big data researchers and traditional social scientists working with small, controlled data sets. The growing chasm between Silicon Valley's next-generation of technology workers and the old guard might limit the creation of truly meaningful technology, as young professionals strive to rapidly create cool apps while ignoring other areas of technology, writes Columbia University computer science graduate student Yiren Lu. Many young workers lack interest in the less glamorous areas of technology such as semiconductors, data storage, and networking, although these tools provide the foundation for Web 2.0 applications. Startups are recruiting the best technology talent, leaving some observers to wonder why today's top engineers are choosing to work for sexting apps rather than helping to cure cancer or fix healthcare.gov, Lu writes. Young people are drawn to work for startups because they offer a cachet and excitement that established firms lack. Although many traditional companies also have impressive talent, older engineers often have skill mismatches with startups and reservations about the startup lifestyle. The role of academia in entrepreneurship is waning, as easy-to-use programming frameworks and application programming interfaces offer simple solutions to entrepreneurs who used to have to write their own code. Lu says the technology industry could benefit from combining the entrepreneurial enthusiasm and creativity of the next generation with the technical expertise and impact of the older generation. The U.S. National Aeronautics and Space Administration (NASA) is turning to the general public for help in spotting the kind of dangerous asteroid that wiped out dinosaurs 66 million years ago. The Asteroid Data Hunter contest is an attempt to reduce the number of false positives found in images from ground-based telescopes. Over the next six months, anyone who develops software can identify life-threatening asteroids will receive a $35,000 (20,000 UK pounds) reward. NASA says it has found 98 percent of dangerous near-Earth asteroids larger than 1 kilometer in size, but existing asteroid-detection systems can only track 1 percent of the estimated objects that orbit the sun. About 100 people track asteroids each day to determine their shape and speed, but NASA wants more, especially over Africa and Asia. "The opportunity as the number of detections increases is for amateur astronomers--our citizen scientists--to help here," says NASA's Jason Kessler. He also notes NASA wants to use an infrared telescope away from the Earth to expand the field of view. University of California, Riverside (UCR) researchers have found that creating a graphene-copper-graphene sandwich strongly enhances the heat conducting properties of copper, a breakthrough they say could lead to the next generation of electronics. "This enhancement of copper's ability to conduct heat could become important in the development of hybrid copper-graphene interconnects for electronic chips that continue to get smaller and smaller," says UCR professor Alexander A. Balandin. At first, the researchers were surprised the improvement of thermal properties of graphene-coated copper films was so significant despite the fact that graphene's thickness is only one atom. However, they realized the improvement is the result of changes in copper's nano- and microstructure, not from graphene's action as an additional heat-conducting channel. The researchers found that chemical vapor deposition of graphene conducted at a high temperature stimulates grain size growth in copper films, and the larger grain sizes in copper coated with graphene results in better heat conduction. They also found that the heat conduction improvement by adding graphene was more pronounced in thinner copper films, which is important because the enhancement should further improve as future copper interconnects scale down to the nanometer range. Arizona State University (ASU) researchers are analyzing big data to explore human-interest dynamics, with the goal of identifying patterns in what motivates people to become interested in particular things, what makes them maintain certain interests, and what causes them to lose interest. "Big data now provides a platform for exploring the dynamics of why people change their minds about certain things," says ASU professor Ying-Cheng Lai. He says learning what attracts and holds a person's interest could lead to better understanding and predicting of human behavior. The researchers are working with three large datasets big enough to eventually provide a credible indication of how much of peoples' decision-making follows patterns, or if it is mostly random. "It is difficult to pin down the exact relationships between all the particles and how all the variables are changing, particularly when changes in the microscopic particles are having an impact on a large macroscopic system," Lai says. However, he says it is possible to deduce from microscopic interactions how macroscopic variables depend upon each other. The researchers say this type of research could be valuable in developing national security and defense strategies, and in guiding the engineering and design of transportation systems and similar high-interaction environments. Innovative graphics processors, new algorithms, and advanced mathematics will soon make the generation of three-dimensional (3D) videos via crowdsourcing possible, according to SagivTech CEO Chen Sagiv. As coordinator of the European Union-funded SceneNet project, Sagiv says "we are going to take the input of many participants, taken from different viewing angles. We will upload these videos to a server where they are synchronized, and thus obtain a 3D reconstruction of the scene. This will allow people to view the scene from any angle. They will then be able to share the video in social networks, maybe by creating ad hoc communities." Sagiv describes producing a view for dynamic scenes as a key challenge of the project, and the effort currently has a preliminary proof of concept which exists as an internal demo. She says the project intends to use existing technology to create the display system. Sagiv also says her team's chief objective is to develop graphics processing computing technology by studying the mathematical aspects, and by devising new algorithms. Among the applications Sagiv envisions for the project's technology are surveillance or tourism, while their current focus is the music community. "As a test case we are using the concept of a musical event due to be organized around January 2016," she notes.